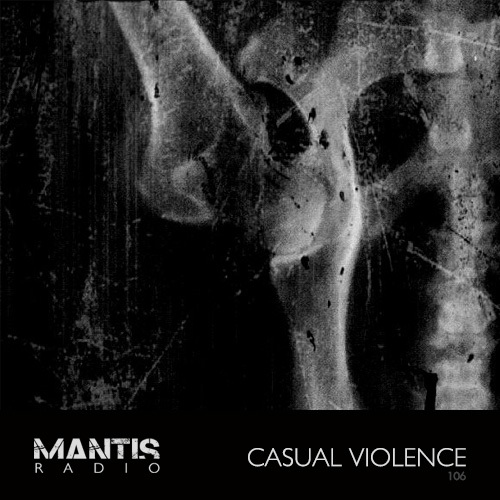 Mantis Radio presents a session from the dark techno lord of Manchester – Casual Violence. Any of you into the darker realms of techno will already know just who CV is and just what he can do with sound. For those of you who have perhaps heard the name but are unfamiliar with the sound, prepare for a session to blow your mind. Hailing from Manchester UK, Casual Violence has a formidable reputation for dark, deep and visceral techno built on a base of rhythmic industrial. Slow builds, walls of texture, atmospheric drone and an ever present discourse of grind progression. His track selection is always on point and I don’t think there has been a single CV mix I’ve heard that I haven’t then spent the following day hunting down tracks he programmed. His exclusive session for Mantis Radio is no different. His work has seen release on some of the scene’s most respected underground labels. Voidloss’s Singularity, Dutch label Aftertase (who released his phenomenal track Briefly Sexual), Rodz Konez, Biomechanics, Subsist and Duality Recs. The work of one man with a clear vision of purpose, not bending to convention or popular consensus, instead choosing to carve his own unique sonic path of destruction. Currently he’s working on a new album Ashes These, scheduled for completion and release around September on his own Maieutics Music imprint together with an EP to accompany the album. Also forthcoming on Maieutics. Back in January CV put together a large collection of his recent original and remix work which is one of the best places to start with bringing his sound into your collection. If you want to witness the full might of CV on a system you can catch him up at Future-Past in Leeds on June 1st (the same date as our Darkfloor Live event in London with fellow techno heavyweights Voidloss and Coefficient), where he’ll be performing alongside Reeko and Forward Strategy Group. Those of you in Lithuania can catch him at the Tundra Festival on July 6th.